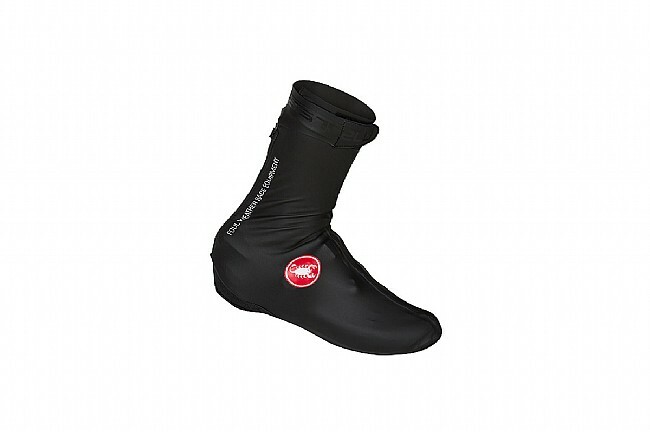 The Pioggia 3 Shoecover from Castelli is made from a PU-coated high-stretch fabric for wind- and water resistance. Inside, the shoe cover features an insulated fleece lining for warmth. The inside edge of the cuff is lined with silicone to seal out water and securely grip the leg. Sealed seams and a waterproof zipper provide yet another layer of protection from the elements. The underfoot is composed of a heavy-duty material to enhance durability and ensure effective, long-term use. Temp. Range: 28 to 54°F (-2 to 12°C). Perfect for cold wet mornings. Tight fit keeps out the weather. Decent, but overpriced for the limited protection. Been trying these out all winter, especially on rainy days. Conclusion, they keep the rain out from the top but riding through puddles or any splash up on the bottom side of your shoe and your feet will get soaked.. I wear shimano R321s and when temps drop in the 30s-40s, toe covers are needed with thermal socks if you're planning to ride 2 hours. I ordered the X-Large for my size 45, fit is perfect. The material on the bottom seems durable and feels like it will last a long time as opposed to many neoprene shoe covers that quickly develop holes from walking or simply putting your foot down at a stop light. One thing to consider is that these are fairly tall, so if you don't have super skinny lower legs, you might find that the fit is a bit tight. It doesn't seem to bother me on rides, but they're definitely snug feeling around my shin and below my calf when I first put them on.